Soften the onion and celery in a skillet. Add all ingredients together and form into cakes 1" thick. Fry on seasoned iron skillet until golden brown, 5-7 minutes per side. Remove from pan and add 1/4 cup water to hot pan and arugula. Cover for 3 minutes. 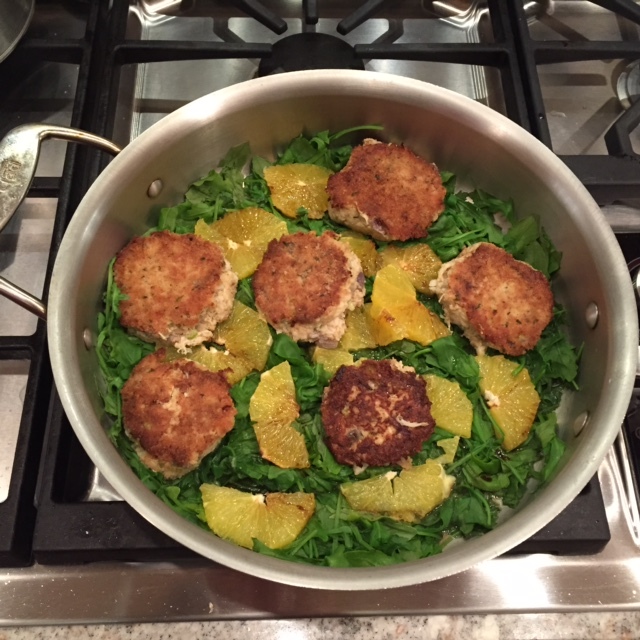 Remove from heat, add crab cakes and garnish with thin orange or grapefruit sections. Lime (or lemon) wedges squeezed on top adds a nice flavor.